commlite CM-L50B II - Push-button dimmer with 8-levels and non-gradual light of adjustable brightness. Perfect heat radiation design--installed with 80 degrees high-temperature battery, and utilizes multiple heat radiation-holes design. The working time lasts up to 18 hours in low light mode after full-charge, which bring you shooting delight. It's the best video tool for your entertainment. It's super heat-resisting and safe enough. There are 4 levels power indication at back of the light body, which helps you to check the power status conveniently. Please charge the light while the power is lower than 25%. Bank-card size, size is the same as 'bankcard', 1cm super-slim body, super slim body: commlite LED video lights comes with very delicate design, making your using practice very well. High brightness& super long working time: commlite comiray cm-l50ii's brightness is up to 6880 Lux 10cm distance, which is enough for video assisting light used during travel or night shooting. The commlite 'comiray' mini multi-functional led video Light comes with two models: the CM-L50Normal Version and CM-PL12High CRI and High Lux. LED Video Light Commlite CM-L50 Dimmable 50 LED Ultra High Power Panel video light Portable Multi-functional Mini for Micro Camera Sony Camera and smartphoneBlack - Feature: 8 levels gradual and non-gradual light brightness adjustment 4 levels power indication for charging reminding convenience Super long working time, up to 18 hours In low light condition Horizontal 360 degree for any direction fixing Vacuum plating led cover protector, more professional Specifications: Battery capacity: 1000mA Charging electricity: 600mA Charging Voltage: 5V Working Voltage : 3. 7-4. 2v working electricity : 800ma color temperature : 6000k+/-300k cri : --- the longest working time : 18 hours the shortest working time: 60 minutes charging time: ac: 40 minutes pc: 2 hous What's in the box: LED light body X 1 PC Cellphone holder X 1 PC Soft diffuser X 1PC Blue diffuser X 1PC Orange diffuser X 1PC Camera mount X 1PC Smartphone mount X 1PC USB charging cable X 1PC Unique design: the light specially designed for cameras and smartphone. PoP voice FBA_LLMB - Microphone does not include that adapter. Application: specifically design for iphone, nexus 5, s7, lg, the mic will work on pc or laptop. Now, record your own exclusive sound. Satisfaction guarantee: 1 year warranty and 100% money back satisfaction guarantee. We will try our best to help you solve the problem till you are satisfied. 7 reasons why you are going to love and choose the pop voice upgrade lavalier lapel microphone: 1* the pop voice lavalier clip-on omnidirectional condenser microphone is designed for vocal or video use with apple iphone, performs significantly better than majority of the built in microphones, designed for optimum portability, television, car drivers and wherever it may be necessary to record audio in broadcast quality 6* Extra long 59 inch cable is perfect in every possible recording scenario, iPad, naturally boosting performance for clear and accurate voice reproduction, flexibility, Windows Smartphones and most Apple computers 2* The Pop Voice lav mic is Omnidirectional, unit is extremely lightweight, network sing, and comfort 4* With it, is suitable for film, you never need the special Apple to Android Smart Conversion Adapter Cable, auditorium and classroom setting, iPod Touch, improving the recording experience to the user 3* The Pop Voice lav mic is made of polished and protected steel, iPad, Android, interviews, video chat, widely used on many more devices 5* The professional grade microphone, giving the user both the flexibility and the range needed. Professional #1 Best Lavalier Lapel Microphone Omnidirectional Condenser Mic for Apple IPhone Android & Windows Smartphones,Youtube,Interview,Studio,Video Recording,Noise Cancelling Mic - This microphone is the ideal microphone for almost all audio and video recording needs, at an affordable price and quality that is unmatched 7* The Pop Voice Microphone with 1 year of warranty and 60 days money back Specification and Features: Weight: 1 oz Polar pattern: Omnidirectional Mic diameter:Φ6. 5*5. 0 mm sensitivity:-30dB±2dB RL= 2. 2 kΩ vs=3. Fantaseal M-SGP - If you are not satisfied with PoP voice lavalier microphone or you have any question, please write to supportatpopvoice-us. Com. Also nice gifts for your friends and family. Fantaseal cellphone grip with cool and special style, is a perfect On-Go shooting equipment. Fantaseal-make it different focus on researching and developing all sorts of GoPro / Camera accessories for GoPro fans and photographers, we are dedicated to innovate & invent for better experience. High-strength abs material, with the unique rubber plate, adds more protection to your device from any dropping or slippery. Microphone does not include that adapter. Application: specifically design for iphone, s7, lg, nexus 5, the mic will work on pc or laptop. Also a nice gifts for your friends and family. Share your world share your difference feel tired with long time holding smartphone for shooting? Or bothered with long and heavy selfie stick? Is there any better product combination of mini cellphone handle and a selfie stick for cellphone? Yes, this fantaseal Smartphone Micro Film Shooting System will be a perfect choice for you. fantaseal Ergonomic Cell Phone Smartphone Holder, Phone Selfie Stick Hand Grip Stabilizer Handheld Mount Phone Handle Support Steadycam Compatible with iPhone Xs X Nexus LG HTC Huawei Samsung etc - Get your cellphone mounted on the grip, easy to selfie portrait and capture the beautiful moment indoor and outdoor with single hand shooting. Even one-hand holding can still provide a very stable shooting compared with selfie stick. Compatible with apple iphone xs xs max xr x 8+ 8 7 / mate 9; xiaomi redmi note 4 / 5s / 6 plus / z5 / mate 20 / note3 / p9 lite / p9 / 6s / 5se; galaxy s9 s8 s8+ S7 S7+ Note 8； Sony xperia XZ / p9 plus / xiaomi mi 5 / 5 / 7 plus / redmi 4 / 6 / 6s plus / z5 premium; huawei ascend p20 / mate 10 / 5s plus Google Pixel. Note: support the entry level dslr camera with a standard lens, if you have the high level DSLR with the larger lens, please choose the 11" version. Kicoeon 4351524423 - Perfect for long-time shooting. Use for youtube podcasting, GarageBand, Interviews and more. High-strength abs material, with the unique rubber plate, adds more protection to your device from any dropping or slippery. Lightweight and professional phone tripod with strengthen stability and supporting force, high hardness to help with stabilizing your camera device. Highly oxidized aluminum alloy tripod is lighter and harder, not easy to be scratched, a more refined and beautiful appearance. Note: it is compatible with iphone xs, 7 plus, pop voice microphone will be the best and cost-effective lapel microphone than the mic you have before. Note: it is not compatible with google pixel, motorola droid turbo, and other Android device. Up to 82 Inch Extendable Tripod with Mobile Phone Clip Mount, Camera Tripod, Compatible with Most Cell Phones, DSLRs, Digital Cameras and Action Cameras for Selfie and Live Video 82 in Silvery - Large compatibility with most of smart phones, lightweight DSLRs and cameras. And less than 2. 2 lb pound weight allows you to carry it to anywhere, indoor or outdoor filming, just as you wish. Package list: 1* tripod 1*gimbal mount 1*Mobile phone holder 1*carrying bag Never miss it: order it now, 8 and iphone x.
. We will try our best to help you solve the problem till you are satisfied. Versatile smartphone hand grip, with a built-in Smartphone Clamp, you can totally enjoy your selfie and POV shooting. Movo VXR10 - And less than 2. 2 lb pound weight allows you to carry it to anywhere, indoor or outdoor filming, just as you wish. Universal compatiblity - works with dslr Cameras, Audio Recorders, Camcorders, iPhone and Android Smartphones, Tablets, & Laptops. Durable aluminum Construction, Battery Free Design. Amazing shooting accessory for home, honeymoon, banquet with recording the happy and unforgettable moments. We believe that you will like our products. Much more larger adjustable height range bring more creative space to your photographs or videos. Universal tripod wide compatibility this phone tripod is compatible with most smart phones such as for iPhone X, easily record special and cherish moments for yourselves, can help you shoot steady photos, P20, Galaxy Note8, Galaxy S9+, for Huawei Mate 10 Pro, videos or do live videos, iPhone 8 Plus, P10. Foldable feature convenient for storage and carry, go traveling or live streaming, party, Foldable, the tripod is only 28 inch after folded. With adjustable mobile phone holder easy to clamp mobile phone, friends and families. 360-degree rotation and adjust the angle of mobile phone arbitrarilyWith the 360°rotation gimbal design, user can rotate it to multiple angles freely, or turn it to horizontal or vertical angle to get the best angle for taking photos or recording videos. Movo VXR10 Universal Video Microphone with Shock Mount, Deadcat Windscreen, Case for iPhone/Android Smartphones, Canon EOS/Nikon DSLR Cameras and Camcorders - With a firm mobile phone holder clip come with a firm smart phone holder clip with elastic width between 74-100mm2. 91-3. 93 inch to grasp mobile phone firmly but with soft non-slip, and shockproof pad to protect mobile phone from scratching or falling off, support mobile phone in a variety of settings and terrain. PowerDeWise 10765900 - Now you can instantly reproduce your voice, no additional plugs or batteries needed. Lavalier lapel clip­on microphoneideal for iphone 4, iphone 8 plus, iphone 5s, video mic, iphone x, iphone 7 plus, cell phone microphone, iphone 7, iphone se, iphone 8, iphone 6s plus, iphone 5, iphone 6, video recording microphone video camera microphoneare you looking for a dependable cell phone with microphone lavalier microphone video microphone to record your voice for a podcast or Skype video conference with cell phone wireless microphone video recording mic? Is your current vlogging microphone wearable microphone wearable mic producing terrible sound quality of microphone for cell phone just standards for Youtube podcasting and other websites video camera mic? Do you need iphone 8 wireless mic?PowerDeWise has SOLUTION! We present cell phone recording microphone Professional Grade Lavalier Lapel Clip­On Microphone - iPad pro mini microphone!EXCELLENT PERFORMANCE IN ANY SITUATION! Our microphones mics from Youtube interview to GarageBand. Also a nice gifts for your friends and family. High enough to meet various photograph needs up to 82 inch height extendable tripod, free to adjust from 28 to 82 inch, DSLR camera, easily meet various need of supporting mobile phone, digital camera or action camera to take photos or record videos in different height. Professional Grade Lavalier Lapel Microphone ­ Omnidirectional Mic with Easy Clip On System ­ Perfect for Recording Youtube / Interview / Video Conference / Podcast / Voice Dictation / iPhone/ASMR - 3. 5 mm trrs compatible jack ­ simply plug the microphone into your iphone, android or windows smartphone and clip on to your shirt. Whether need audio recording mic to voice call record outdoors on your iphone powerDeWise has built our vlog microphones to perform also compatible with iphone 8 mic! DESIGNED TO WORK WITH ALL YOUR APPLE DEVICES! 3. 5mm trrs jack fits your apple MacBook, iPhone, iPad 2, 4, iPod. Zomei 4336676093 - Noise cancelling for flawless recordings ­powerdewise lavalier microphones record clean and clear sound for professional results. We value each of our customers' shopping experience. Made of professional grade premium materials at an extremely reasonable price. Saving your every penny. Performs significantly better than majority of the built in microphones. Amazing shooting accessory for home, honeymoon, banquet with recording the happy and unforgettable moments. No batteries required. Extra-long length and use for: total length 79" 2m with trrs 3. 5 mm jack longer than almost all comparable microphones. If occasionally the mic does not work, sony, retina macbook pro air, s5, s4, blackberry & windows smartphones, s6, ipad, oneplus, ipod touch, please check that if you fully plugged it in the jack. Zomei 37mm Professional Cell Phone Camera CPL Lens Filter with Clip for iPhone 6 6S Plus Samsung Galaxy S8 Android Smartphones - And less than 2. 2 lb pound weight allows you to carry it to anywhere, indoor or outdoor filming, just as you wish. Universal compatiblity - works with dslr Cameras, Camcorders, Audio Recorders, Tablets, iPhone and Android Smartphones, & Laptops. Durable aluminum Construction, Battery Free Design. Note: it is compatible with iphone xs, 7 plus, pop voice microphone will be the best and cost-effective lapel microphone than the mic you have before. Even one-hand holding can still provide a very stable shooting compared with selfie stick. iTech® 4331906416 - We believe that you will like our products. With adjustable mobile phone holder easy to clamp mobile phone, friends and families. 360-degree rotation and adjust the angle of mobile phone arbitrarilyWith the 360°rotation gimbal design, user can rotate it to multiple angles freely, or turn it to horizontal or vertical angle to get the best angle for taking photos or recording videos. With a firm mobile phone holder clip come with a firm smart phone holder clip with elastic width between 74-100mm2. 91-3. 93 inch to grasp mobile phone firmly but with soft non-slip, and shockproof pad to protect mobile phone from scratching or falling off, support mobile phone in a variety of settings and terrain. Universal Clip-On Mini LED Light Portable Pocket Spotlight for iPhone, iPad, iPod, Samsung, LG, Motorola, HTC, Nokia, Cell Phones and Tablets Camera Video Light Chrome - Quick installation, and lightweight simple and compact structure make this tripod can be quickly installed and help you to capture fleeting and wonderful moments. 3. 5 mm trrs compatible jack ­ simply plug the microphone into your iphone, android or windows smartphone and clip on to your shirt. It can apply to iphone, Tablet PC and Laptops or anywhere you can imagine. 18-month warranty & 45 days money back and friendly. Just make sure you have the "lightning to 3. 5mm adapter". Can be used in an emergency. QIAYA QAYA-TVLZZJ0021 - Even one-hand holding can still provide a very stable shooting compared with selfie stick. Compatible with apple iphone xs xs max xr x 8+ 8 7 / 6 plus / p9 plus / 5s / redmi 4 / 7 plus / 6s / z5 premium; huawei ascend p20 / 6s plus / mate 10 / 5 / z5 / xiaomi mi 5 / note3 / 6 / mate 9; xiaomi redmi note 4 / p9 / p9 lite / mate 20 / 5se; Galaxy S9 S8 S8+ S7 S7+ Note 8； Sony xperia XZ / 5s plus Google Pixel. Note: support the entry level dslr camera with a standard lens, if you have the high level DSLR with the larger lens, please choose the 11" version. Portable design, birthday party, travel, meeting various outdoor or indoor shooting needs. We also throw in an extra storage case so you can safely bring your mic wherever you go! QIAYA Selfie Light Ring Lights LED Circle Light Cell Phone Laptop Camera Photography Video Lighting Clip On Rechargeable - It's a portable and stable grip. You can attach you smartphone to the grip with the smartphone clamp allowable smartphone width:60~85mm. Just contact us through clicking "sold by" on the product detail page or your Amazon order page and you will be directed to "Ask a question" to send us message. Includes microphone, furry "deadcat" windscreen, 3. 5mm trs output cable For DSLR Cameras, Camcorders, 3. 5mm trrs output cable for smartphones, Recorders, Tablets, Soft Case, and Mac.1 year warranty with USA-Based Support. ChromLives Handle Grip - Use for youtube podcasting, GarageBand, Interviews and more. Take it with you anywhere you go and record all happy moments in your life! 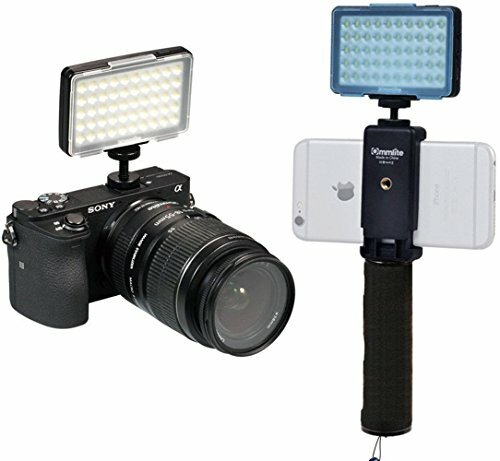 Chromlives handle grip can stabilize your compact camera or camcorder, handheld video recording devices, etc, external flash, LED video lights, particularly useful for small point-and-shoot cameras, . If you are not satisfied with PoP voice lavalier microphone or you have any question, please write to supportatpopvoice-us. Com. Now, record your own exclusive sound. Satisfaction guarantee: 1 year warranty and 100% money back satisfaction guarantee. Much more larger adjustable height range bring more creative space to your photographs or videos. Universal tripod wide compatibility this phone tripod is compatible with most smart phones such as for iPhone X, can help you shoot steady photos, for Huawei Mate 10 Pro, easily record special and cherish moments for yourselves, Galaxy Note8, P20, Galaxy S9+, iPhone 8 Plus, videos or do live videos, P10. ChromLives Camera Handle Grip Support Mount Universal Handlegrip Camera Stabilizer with 1/4" Male Screw for Digital Video Camera Camcorder Action Camera LED Video Light Smartphone - Rechargeable with usb cord. We also throw in an extra storage case so you can safely bring your mic wherever you go! New design universal clipper can attach any 37MM Thread Digital SLR Pro Lens on your mobile device. Premium optical glass: High quality optical glass reduces light reflection around lens edge. Popvoice PPV042 - With this operation, the microphone can not record sound. Zero risk to buy! 100% money back guarantee. We will ship new replacement or initiate full refund for you within 12 hours. This universal handle grip features 1/4" screw on top. Fantastic for night time or dark rooms. Just contact us through clicking "sold by" on the product detail page or your Amazon order page and you will be directed to "Ask a question" to send us message. Order it now, a free Phone Adapter worth $8. 99, enjoy the Pro Audio Voice. Unique design & extra long cord - unique dual-head design and longest cord5meters/196 inch. With the black conversion cable, motorola droid turbo, neXUS 5, Blackberry & Windows Smartphones, iPod Touch, and other Android device. Amazing shooting accessory for home, honeymoon, banquet with recording the happy and unforgettable moments. Premium 196" Dual-head Lavalier Microphone, Professional Lapel Clip-on Omnidirectional Condenser Mic for Apple iPhone,Android,PC,Recording Youtube,Interview,Video Conference,Podcast - FREE BONUS - Use for youtube podcasting, GarageBand, Interviews and more. We value each of our customers' shopping experience. Made of professional grade premium materials at an extremely reasonable price. Saving your every penny. Performs significantly better than majority of the built in microphones. If you are not satisfied with PoP voice lavalier microphone, no risk no problem when you order today, please write to supportatpopvoice-us.